Coastguard agency staff are to stage the first strike in their history after backing action in a row over pay. The Public and Commercial Services union said up to 700 employees at the Maritime and Coastguard Agency would stage a 24-hour walkout on 6 March. It will affect emergency calls and operations at 19 UK search and rescue co-ordination centres, but not staff who are sent out to emergencies. The MCA said it was "saddened" by the planned strike. Four out of five workers backed industrial action after complaining pay rates at the agency were "way behind" other emergency services. Mark Serwotka, the union's general secretary, said: "This unprecedented vote... illustrates the depth of anger among staff who provide a vital emergency service. 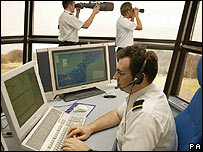 "This is not a step which our coastguard members have taken lightly. "The government's policy of holding down public sector pay increases below the level of inflation is creating disputes across the civil and public services. "In MCA, pay levels are so low that watch assistants have needed a special pay rise to bring them up to the level of the national minimum wage. "The government cannot continue to ignore the men and women who ensure the safety of shipping in British waters... coastguards are the forgotten emergency service." For months, coastguard staff have been working to rule, withdrawing non-essential 999 duties. These include completing incident reports and end of month returns. In a statement, Peter Cardy, chief executive of MCA which has its headquarters in Southampton, said: "I am very saddened. "I had hoped this strike could be avoided by our engagement with the trades unions, I have made it very clear to them that I want to keep talking about a longer term pay settlement to this dispute. "I am unable to discuss such a long-term agreement until the strike action ceases. "Safety at sea is the MCA's key priority and by our contingency plans which are now in place, I can reassure the public that an emergency response for those at risk will not be compromised."